Great for tansitioners! Pre treating the hair before you shampoo is recommended for those dealing with two textures. Pre pooing will help reduce breakage at the line of demarcation. Honey: Is a good emollient and softener. Prevents the loss of moisture and heals scalp infections. Gives you more shine and luster to your hair. Banana puree: Increases the moisture content of your hair. Eliminate frizz. Great for dry, itchy, flaky hair. Olive fruit oil: Improves hair elasticity and strength. Block DHT, which leads to hair loss. Penetrates the hair shaft by 25%. Avocado oil: Penetrates the hair shaft more than evoo. moisture. High in Vitamins A, E, and D. Stimulates new hair growth when massaged into the hair roots. High in fatty acids, which provides strength and protection to the hair. Wheat germ oil: Highly moisturizing to the hair and rich in fatty acids. Easily absorbed into your skin. Adds softness and strength to your hair. Neem oil: Awesome for relieving an itchy scalp and dandruff. Stimulates hair growth. With consistent use you will see longer, fuller, luxurious hair. Antiseptic and antibacterial. Carrot oil: Heals dry hair. 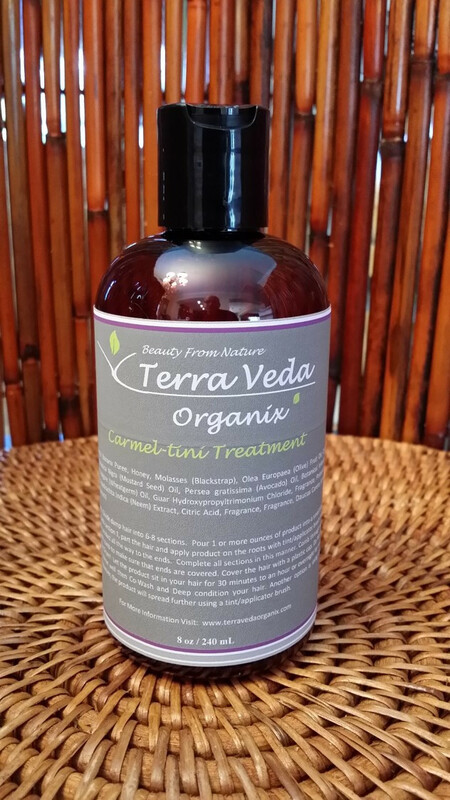 This awesome pre poo is great for those with a dry itchy scalp. Great for reducing tangles and infusing extra moisture into your hair. Use this as a pre treatment before you shampoo. Consistent use will make your hair softer with less tangles. Less tangles leads to better hair growth. Longer, stronger, more luxurious hair with the Carmel-tini treatment. Order you Carmel-tini here and check out her other natural hair products. Terra Veda Organix, created with your coily. curly hair, in mind.